Frameless cabinetry is simply a box with no frame. The front edges are covered with either wood veneer or PVC edge tape to match the cabinet fronts. There may be a full top or a front and back stretcher bar. 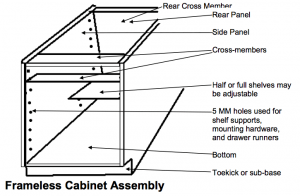 A quality frameless cabinet will have the backs locked in with a bead of hot melt glue or staples or even both. There may be vertical and/or horizontal dividers to define storage options. These cabinets are almost always made of 3⁄4” material although some are made from 5⁄8” stock. Studies have shown that frameless cabinetry can allow 10-15% more useable storage space than face framed cabinetry in the same exact layout. 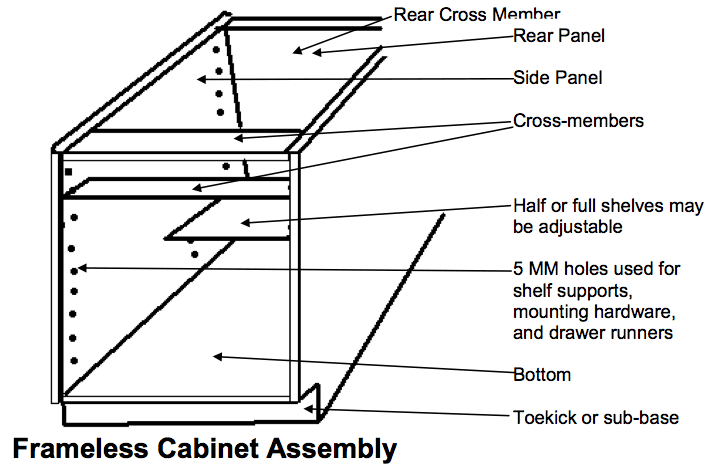 In frameless construction, doors are mounted to the walls of the cabinet and can fit one of two ways: flush with the frame (inset) (which is rare), or completely overlaid. The following figures illustrate each. The major advantage of the frameless construction is the total accessibility to the case interior and the clean simple design statement made by the finished product. Some concerns exist regarding the stability of this type of construction: there is a tendency for frameless cases to “rack,” and also there is the additional planning expertise required to ensure proper clearance detailing. Both types of cabinets are available in all price groups and are competitive in that way. The bottom line is “you get what you pay for” in either style. In most projects the cabinetry will probably be the largest part of the materials budget.